The Ancient City of Aleppo has been ruled, among the other, by Romans, Byzantines, Seljuqs, Mamluks and Ottomans. It is one of the oldest inhabited cities in history. It knew human settlement since the eleventh millennium B.C. through the residential houses which were discovered in Al-Qaramel Hill. It occupies a strategic trading point midway between the sea and the Euphrates. The main role of the city was as a trading place. The historic buildings that remain include the Citadel and several medrassahs dating from the 12th and 13th centuries, and numerous mansions, palaces, churches and mosques that were added until the 19th century. There has always been a strong rivalry between Aleppo and Damascus. For me though, Aleppo (based on my visit in 2004) has more charm and is more relaxing. It's less touristy and has some amazing restaurants in its ancient quarter. The day trip from Aleppo to Latakia on the coast was a bit of an anticlimax... better to stay in Aleppo if you have the time. Aleppo is well worth a day of anyone’s time. With a range of buildings both monumental and everyday from between the 12th and 17th centuries it has been inscribed for its “its cohesive unique urban fabric”. Well, I don’t know about that but it did feel quite “Middle Eastern” and “Arabic” to me. The highlights are the citadel (photo) and the covered souqs. The museum has some superb Hittite statues. Although it has a population of almost 2 million the main sights are within reasonable walking distance of each other. We thought the “famed” Baron Hotel with its “period” (some would say “grotty” –though it may have been renovated since we were there a few years ago!) furnishings and the signature of Lawrence of Arabia in the visitor’s book somewhat overpriced – worth having a look round but there are plenty of other hotels in the area (which is certainly convenient for the historic sights). Triumphal Arches: Al-Tuteh Mosque includes an ancient Roman triumpal arch. 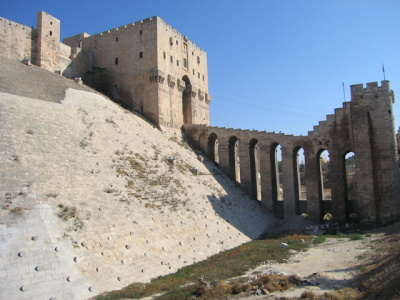 The Crusades: The Citadel of "Aleppo" is a major component of the WHS and has a significant connection with "The Crusades". Johann Ludwig Burckhardt: Burkhardt's base from 1809/12 after being accepted by the "Association for Promoting the Discovery of the Interior Parts of Africa" or "African Association" to penetrate the central and western Sudan. Perfected his Arabic there, adopted an Arabian persona and probably genuinely converted to Islam. Ibn Battuta: "Halab [Aleppo] is one of the most illustrious of cities, and one which has no rival in beauty of plan and perfection of arrangement, and in the spaciousness and symmetrical disposition of the bazaars"
Built in the 12th century: "Aleppo is an outstanding example of an Ayyubid 12th century city"